This week has been a particularly busy one for the emerging smartwatch market, with Google having finally unveiled its Android Wear OS designed specifically for wrist-mounted gizmos. Straight after the announcement, Motorola teased its Moto 360 smartwatch, and even though we’ve several other devices to look forward to from partners including LG, HTC and ASUS, the Moto 360 immediately struck a chord. Finally, it seems, we have a smartwatch that oozes style and a sense of being a traditional watch as much as a toy for geeks, and now, we also have what is claimed to be info relating to the device’s specifics. 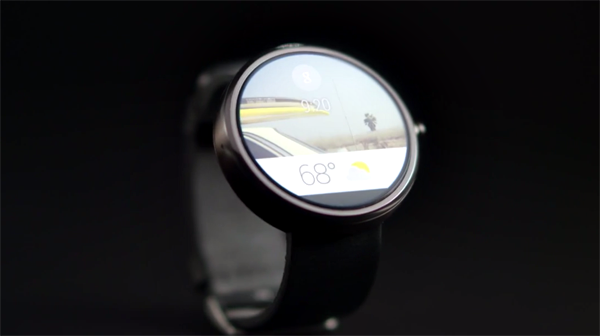 Aside from the slick, elegant design, there are already plenty of reasons to be excited about the Moto 360. For one, it will not be charged using the traditional micro USB port, but according to a recent Hangouts Q&A, will use a secret power-up method. Whether this will take the form of traditional wireless charging or Motorola has something else up its sleeve, we’ll have to wait and see, but the fact that it’s focusing on a solution that once again retains a more authentic watch-wearing experience is definitely promising. A leak early Friday on Weibo has attempted to shed some light, noting that the enigmatic battery tech would comprise of a magnetic induction, and the tidbit also presented a little more info with regards to the display. Apparently, the Moto 360 will boast an OLED display bolstered by the presence of Sapphire Glass, which will protect it from the everyday scratches and scrapes that it will inevitably encounter, and although none of this can be verified or confirmed, it does tie in with what Motorola has already been telling us. The device is shaping up rather nicely, and in particular, it’s good to see Motorola taking steps to ensure the battery performance is up to scratch. One of the issues that some smartwatches have suffered hitherto – without naming any names – is in poor battery retention, but with the former Google subsidiary clearly doing its homework, the Moto 360 could prove a big hit in the consumer market. There’s still no information with regards to the workhorse components of the device, including processor or RAM, but hopefully, these details should be made available to us fairly soon. In the meantime, feel free to drool over the images of the Moto 360, and be sure to leave your initial impressions of the device in the comments section below.